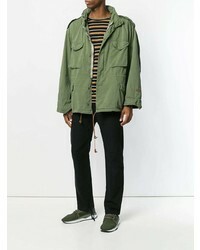 If you're searching for a casual yet sharp getup, try teaming a 424 Fairfax X Alpha Military Jacket from farfetch.com with navy skinny jeans. As well as super comfortable, both of these items look wonderful paired together. Let's make a bit more effort now and choose a pair of black suede tassel loafers. 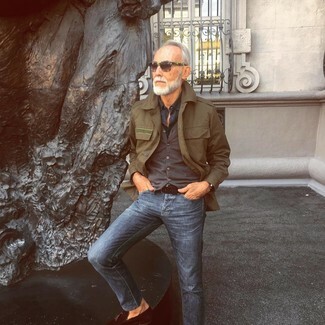 If you're on the hunt for a casual yet seriously stylish outfit, try teaming a 424 fairfax x alpha military jacket from farfetch.com with light blue jeans. Both garments are totally comfortable and will look great paired together. 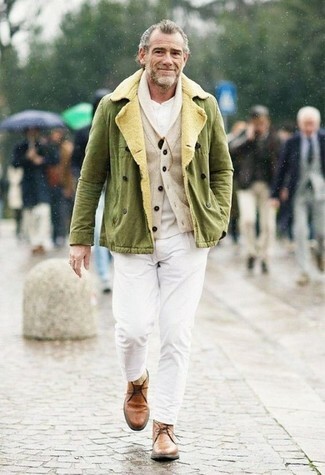 You could perhaps get a little creative when it comes to footwear and spruce up your outfit with beige suede loafers. If you're on the lookout for a casual yet seriously stylish outfit, marry a 424 fairfax x alpha military jacket with light blue chinos. Both items are totally comfortable and will look great paired together. Grey suede low top sneakers will contrast beautifully against the rest of the look. 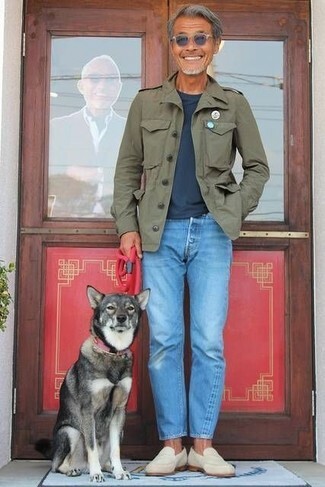 If you're in search of a casual yet dapper getup, marry a 424 fairfax x alpha military jacket with burgundy chinos. Both items are totally comfortable and will look great paired together. Opt for a pair of white leather low top sneakers to make the look current. 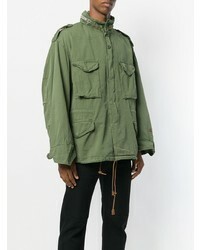 If you're on the hunt for a casual yet on-trend getup, marry a 424 fairfax x alpha military jacket with black jeans. Both items are totally comfortable and will look great together. For something more on the daring side to complete this outfit, make white leather low top sneakers your footwear choice. 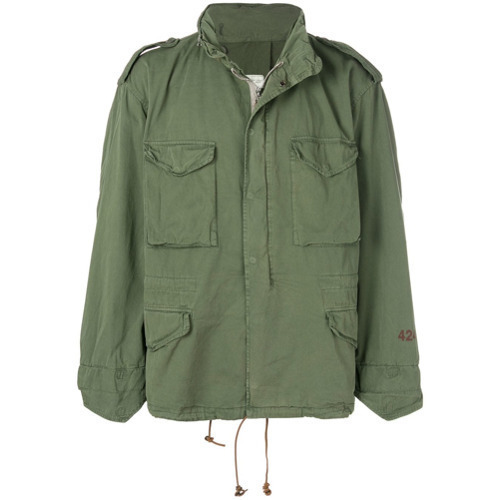 To create an outfit for lunch with friends at the weekend marry an olive military jacket with grey shorts. Rock a pair of white high top sneakers to make the getup current. 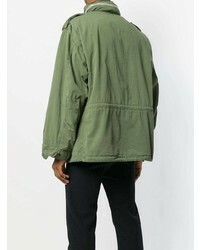 If you're on a mission for a casual yet on-trend outfit, consider pairing a 424 fairfax x alpha military jacket from farfetch.com with black chinos. Both pieces are totally comfortable and will look great together. Go for a pair of black leather high top sneakers to make the getup more current. 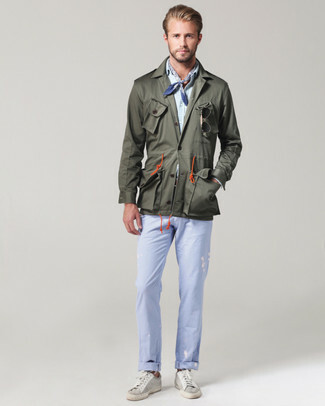 If you're on the hunt for a casual yet sharp outfit, dress in a 424 fairfax x alpha military jacket and white chinos. Both garments are totally comfortable and will look great together. When it comes to shoes, this outfit is round off really well with brown leather desert boots. 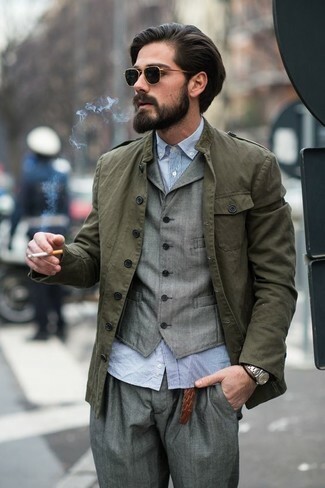 For a nothing less than incredibly stylish ensemble, wear an olive military jacket with grey dress pants.